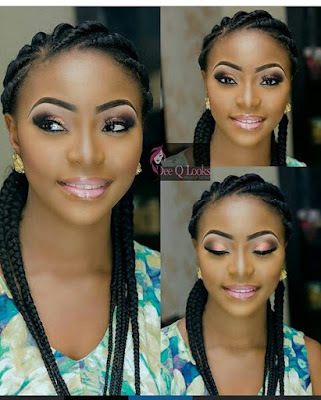 20 Most Stylish Cornrows braids for every woman with beautiful pictures - BlogIT with OLIVIA!!! Banana Ghana braids stems from the curvy pattern associated with the braids. It doesn't necessarily means it's banana but it's shape is where the name was gotten from. This is a must style for different occasions. It can be worn casually or for an event. Cornrows braids have been known for its uniqueness in almost every face, its another form of Ghana braids but its a lot easier to plait than Ghana braids. Most times, one is required to make use of extensions while some still braid with their natural hair. This unique hairstyle and braids fits perfectly well on almost every face. There's a reason why you would want to opt for this style. Because not only does it look unique and beautiful but it sort of gives the wearer a confidence that comes from the heart, knowing well that "Your BRAIDS is beautiful." With your cornrows braids, you are beautiful, gorgeous and cute. Cornrows braids are a girl's favorite. Whether you are battling with hair loss or not, cornrows braids is definitely an hairstyle to rock. With cornrows braids, you can be a little adventurous. Of course, your stylist must be one who updates his or her styling skills with the latest fashion trends. That's one of the surest way to know what's trending in hairstyles and be able to keep up with the competition. I recommend olive edge control to be able to make your hair edges look good just like in the pic above. With your edges in check and or control, you stand a chance of looking more beautiful in your cornrows braids. Some cornrows braids can actually look bigger than some and that's perfectly okay. If you must go for the biggest sized cornrows braids, then i think it's cool to keep it simple but neat. And be sure to not have a big scalp so you don't come out looking weird. With cornrows braids, creativity abounds. 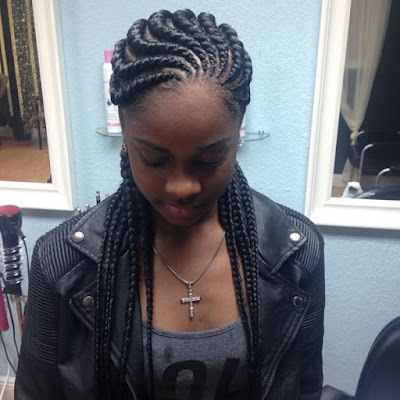 There are hairstylists who can dish out beautiful cornrows braids. Be sure to have the particular style you want for your cornrows braids not only in mind but in pictures too. If you like this particular style, the curved -in pattern, then you must save it. This is so your stylist don't give another different thing. There are other beautiful cornrows braids in this post. All you should do is go through all of them and pick out the best that you love most.